XMOS, a leading supplier of voice and audio solution is proud to be involved in this new voice interface development kit, “codama”, jointly developed by Yukai Engineering and NTT DOCOMO. 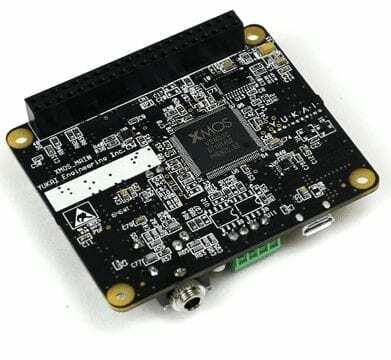 The “codama” voice interface development kit includes the XMOS VocalFusion XVF3100 voice processor; it enables AI engineers and developers to build a voice interface with NTT DOCOMO “AI Agent API” into their products. This technology brings people the freedom to control their electronic devices and access a wide range of IoT services by simply using their voice – wherever they are in the room and whatever is happening around them. The XVF3100 delivers outstanding voice capture accuracy over long distances; its barge-in capability means the user can interrupt any music playing on the consumer device, even when it’s playing loudly, and the wake-word is spoken softly. Additionally, the XVF3100 uses beamforming to capture the direction of arrival of the voice command and track the person speaking as they move around the room. Sophisticated algorithms deliver acoustic echo cancellation, dereverberation and noise suppression, to capture the voice of interest and clean up the signal for onward send to the NTT DOCOMO “AI Agent API”. Finally, Yukai have added an excellent personalisation feature that lets people create their own wake-word on Yukai Engineering’s website and download it to their device. Mr. Yoshikazu Akinaga, Manager of Innovation Management Department at NTT DOCOMO said, “NTT DOCOMO developed AI Agent API to ultimately provide end users with all-new speech AI experiences based on highly natural AI-supported communication. Today, we are very excited to introduce new speech development kit integrated with XMOS’s class-leading far-field voice interface technology working with Raspberry Pi and NTT DOCOMO AI Agent API seamlessly. This kit enables everybody to develop speech and dialog service “device” easily. We are very grateful to Yukai engineering and XMOS team collaboration to takes this major step forward for achieving our goal. We are expecting all users to enjoy new speech AI experiences.”. The “codama” voice interface development kit will be sold from 21st December 2018 via Yukai Engineering, MACNICA and Amazon. You can pre-order via Amazon.co.jp from 3rd December 2018 (the pre-order link can be found on Yukai Engineering’s web-site). The kit will be demonstrated at DOCOMO Open House 2018, Tokyo Big Sight, 6th December to 7th December 2018. XMOS is a leading supplier of voice and audio solutions to the consumer electronics market. Unique silicon architecture and highly differentiated software positions XMOS at the interface between voice processing, biometrics and artificial intelligence. For more information, please visit www.xmos.com. NTT DOCOMO, Japan’s leading mobile operator with over 74 million subscriptions, is one of the world’s foremost contributors to 3G, 4G and 5G mobile network technologies. Beyond core communications services, DOCOMO is challenging new frontiers in collaboration with a growing number of entities (“+d” partners), creating exciting and convenient value-added services that change the way people live and work. Under a medium-term plan toward 2020 and beyond, DOCOMO is pioneering a leading-edge 5G network to facilitate innovative services that will amaze and inspire customers beyond their expectations. DOCOMO is listed on the Tokyo stock exchange (9437). www.nttdocomo.co.jp/english/. Yukai Engineering is a start-up comprised of designers and engineers who are passionate about making our daily lives more fun and fulfilling with robotics technology”. Their award-winning products include Necomimi (selected for the Time magazine’s “The World’s 50 Best Innovations 2011” list), and BOCCO, a communication robot that keeps family members in touch with each other. For more information, please visit www.ux-xu.com.